When asked why "Nandana" is called "Nandana"? Banwari Jariya belongs to the 6th generation of "Chippa" community of Tarapur answered that when hand block printing started by local "Chippa" community in Tarapur they were using Indigo maat or dye tank locally called as "Naand" (नांद) in Hindi, which means pot or hole in English. So from a word "Naand" used for indigo dyeing tank in Hindi and fabric dipped in indigo dye tank multiple times was the reason behind using word "Nandana" for this craft of hand block printing practiced exclusively in Tarapur only. 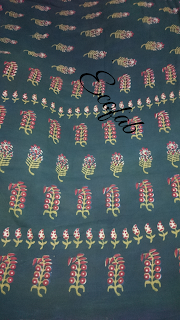 In Nandana hand block printing process fabric first printed with begar (Alum & tamarind seed paste) and then dyed with alizarin to get red design pattern. 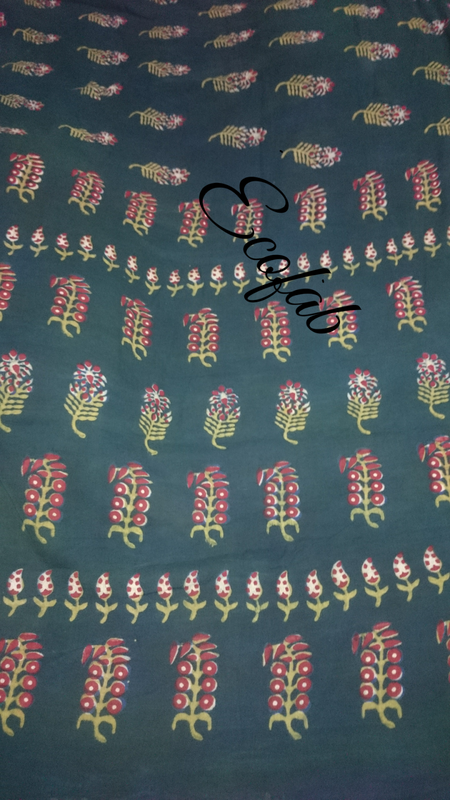 After this fabric get printed with Dabu resist with "resin" paste, in local chhippa community it is called as "Daamar" (Coal-tar in English) covering red designs and dipped into indigo dye tank to get deep indigo blue background. Traditionally resin paste is used as a better resist so that fabric get dipped into indigo tank minimum 5-6 times till it gets deep blue. "Resin" was boiled for 24 hours then it printed on the fabric while boiling. In this step boiling resin produces a bad odor and also sometimes it spates on the skin of craftsman create rashes. After this fabric get boiled in soda ash solution to remove the “resin” paste. Now after washing the resist paste it again printed with mud resist and then dipped into pomegranate rind dye. After performing this step fabric background becomes deep green to black, some parts which was printed with resist becomes yellow and red is remain there. Now fabric is ready for market. Today "resin" paste is replaced with "mud" resist due to heath issues of craftsman. This dyeing craft of hand block printing only practiced in #Tarapur village situated on the banks of Ghambhiri River in Madhya Pradesh. Nandana is having 16 steps going through cumbersome process of printing and dyeing. Almost 100 families of Tarapur and Ummedpura village of Javad tehsil were involved in the craft. Now only 2 families are doing traditional hand block printing but they too left Nandana printing because of its tedious, time consuming process and no market reach. Traditionally Nandana process involved use of 4 designs namely, Mirch, Champakali, Amba & Jalam buta. Later on one more design “Dholamaru” introduced in this craft. To create a single design 4 different blocks used in the Nandana technique. Basically market for Nandana printing was limited to tribal people of Jhabua, Ratlam, Mandsaur and Neemuch district of Madhya Pradesh only. When tribal got low cost screen printed hosiery material as an alternative they left wearing Nandana. 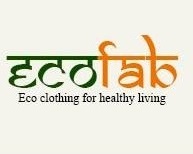 EcoFab started working with one of the hand block printer family of Tarapur village in the year 2015 who was interested in reviving Nandana printing. Today it is available in green and blue shade and other shades work is in process. 1. Use of natural mordant like alum to get red with alizarin, pomengranate peel and indigo to get green or black. 2. Use of fixed 5 designs right from small buti to big buta known as mirch, champakali, dholamaru, amba and jalam. 3. One design requires 3 different blocks. 4. Traditionally available in black background but now a day blue and green background also marketed as Nandana, because “Nand” is used in the process. 5. It’s a 16 step process technique. Sometimes all 5 designs used in Nandana with red and white combination with indigo background considered as Nandana printing. Technically it comes under Tarapur printing which is a combination of alizarin and indigo hand block printing. Since its inception Nanadana printing restricted to the tribal customer segment only so no development in terms of design and color variations done till date. Traditionally Nandana is linked with both designs and cumbersome process. Now with the intervention of EcoFab it is in the process of rejuvenation.